Campolina horses originated in Brazil in 1870 when a farmer named Cassiano Campolina bred a Brazilian mare of Barb ancestry with a pure Andalusian stallion. Later he further refined his horses with Anglo-Norman, Clydesdale, Holsteiner, American Saddle Horse, and Mangalarga Marchador horses.The result is the largest of the three gaited Brazilian breeds. Their temperament is docile, but active and proud. They are used for pleasure and trail riding, dressage, and driving. The Campolina is a gaited breed, with an ambling gait. Their gaits are a smooth, regular batida or a picada, the first characterized by a longer time of movement of the bipeds in diagonal and the second only in lateral, both with four-beat movements. The gait is called the true marcha or marcha verdadeira. Campolina horses neither trot nor pace. The most revered Campolina horses are a silver-grey. Other popular colors are dun, bay, buckskin, and pinto, although they can be found in almost any color. They weight between 1,200 and 1,300 pounds for stallions and between 770 and 990 pounds for mares. Their height varies from 15 to 16.2 hands. Campolina horses’ head is proportional in size to the rest of its body, having a flat forehead and well-separated lower jaw. Their profile is straight to a subconvex line in the bridge of the nose; their eyes are medium to large in size; their nostrils are large and flexible; their neck is arched, muscular, proportional and well inserted into the shoulder. 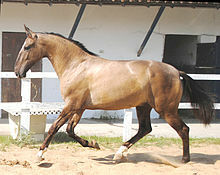 Their withers are well defined and long; their chest is deep, wide and not too prominent; their ribs are long and arched; their back is medium in length; their loin is short and well muscled; their croup large and long, smoothly inclined; their tail set medium-high; mane and tail are silky in texture. The breed standards were first defined in 1934 when the herdbook was closed and the introduction of outside breeds was no longer accepted. The Professional Consortium of Campolina Horse Breeders was formed in 1938 to formally organize the breed. The organization was renamed the Campolina Breeder Association in 1951 which is when the breed standards were formally adopted. The breed standards were updated in 1975 and 1993. There are currently around 85,000 registered Campolina horses, with slightly over 7,300 registered breeders.